At this point, to say that the Vape industry is booming would actually be a little bit of an understatement. According to one recent study, the global e-cigarette and vaporizer market is expected to grow at about 20.8% over the course of the next decade – eventually ballooning to a massive $61.4 billion in value by as soon as 2025. Especially with states like Indiana and others recently legalizing the use of CBD oil, it’s easy to see why so many new businesses are already cropping up in this space – there is a significant market that needs to be serviced and, right now, there aren’t enough people to do it. 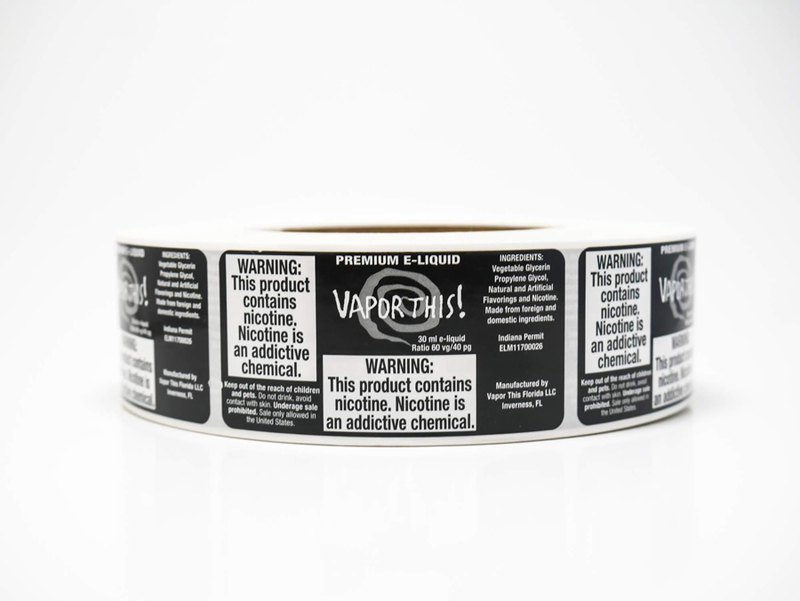 But the most important thing that this new wave of vaping entrepreneurs will need has less to do with the products themselves and concerns itself more with the labels they carry. Whether you’re a seasoned business professional or are entering into the world of small business ownership for the first time with your vaporizer business, digital printing services like those offered by Unique Printing & Labels are about to become the critical asset you need when you need it the most. Not only do most vaporizer businesses rely on small-but-strong, niche audiences, but they also tend to roll out new products on a regular basis – both of which are problematic for services that still require larger production orders. With our digital press, however, we can set up any order within a couple of linear feet – meaning that there is literally no minimum order quantity that you have to concern yourself with. This can not only help make sure that you’re in a position to have a great label printed without being forced to order more than you need, but it also gives you the opportunity to pivot as the industry around you does the same. Indiana is just one example of the many states that enacted some very strict labeling laws recently concerning vaporizer oils and other related products. Even if you printed your labels before those laws went into effect, violations can be incredibly severe. With digital printing and short run capabilities, however, this is something you don’t have to worry about. We can make any adjustments you need in a very short amount of time, making sure that you’re compliant (and that your regulators are satisfied) far faster than ever before. If you’d like to find out more information about how our solutions are perfect for your Vape industry retail business, or if you’d just like to discuss something more specific with someone in a little more detail, please contact us today!